College tuition is expensive and generally increases faster than the rate of inflation. For parents of high school children, it's never too early to start researching scholarship and grant opportunities. To help offset the rising costs of tuition and related college expenses, advanced preparation is key. Luckily, military children can benefit from special college scholarships if their parent(s) joined the Army, Navy, Marines, Air Force, or Coast Guard. For example, the Air Force offers the General Henry H. Arnold Education Grant Program, while the Army provides an Army Scholarship Foundation. Every year, American Veterans (AMVETS) awards six $4,000 scholarships ($1,000 per year for four years) to help offset fees associated with attending an undergraduate, technical, or trade program in pursuit of a degree, certification or license. Applicants must be a child or grandchild of a U.S. Veteran and maintain a 3.0 high-school GPA. AMVETS also awards three $4,000 scholarships to children of veterans. The Fleet Reserve Association (FRA) offers numerous scholarships to children of service members in the Navy, Marine Corps, and Coast Guard. Recipients must be full-time students enrolled at an accredited college or university in the United States. Awards are provided up to $5,000 to individuals pursuing college and graduate degrees, and the foundation provides about $100,000 each year to recipients in need. Offered through the Army Emergency Relief Fund, this program is available to Army kids of active duty, as well as retired and deceased service members. Applicants must have a 2.0 GPA and be under the age of 22. This need-based scholarship program was established to assist children of Army Soldiers, and amounts range anywhere from $600 to $4,000. This program is offered through the commissaries and the Fisher House Foundation. More than $16 million dollars have been awarded in seventeen years. 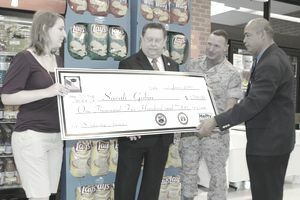 Each commissary awards a $1,500 scholarship to a selected recipient. It's open to children of active duty, Reserve, Guard, retired, and fallen U.S. service members, and applicants must be under age 23 and have a 3.0 GPA. The Air Force Sergeants Association (AFSA) and the Airmen Memorial Foundation provide several scholarships ranging from $500 to $3,000. Air Force dependents of active duty, Reserve, Air National Guard, retired, and Veteran status are welcome to apply. Memberships are also offered annually for enlisted members, former members, family members, commissioned officers, and more. Researching, applying for, and receiving scholarships or grants is a time consuming, and often very frustrating process. Chances are, you won't get every one you apply for, so it's important to be patient. To increase the chance that your child will land a scholarship, it's worth spending time on each organization's website, carefully reading over the guidelines, requirements, and deadlines. Making a mistake in your paperwork or your online application could ruin your chances of getting the financial support you and your child deserve.